Freckles are flat, circular small discolored spots of melanin on the skin of people with fair complexion. They are mostly seen on the face but can develop on any part of the skin when it is exposed to the sun. There is no health risk associated with the presence of freckles but in very rare cases it may lead to very rare types of skin cancer. It is common among children between the ages of 5 years and 15 years. 1. Exposure to Sun: Exposure to the sun is the major cause for the development of freckles. It develops when you are out in the sun without skin protection and UV rays come in contact with your skin. Once the exposure to sun reduces, the freckles start fading. 2. 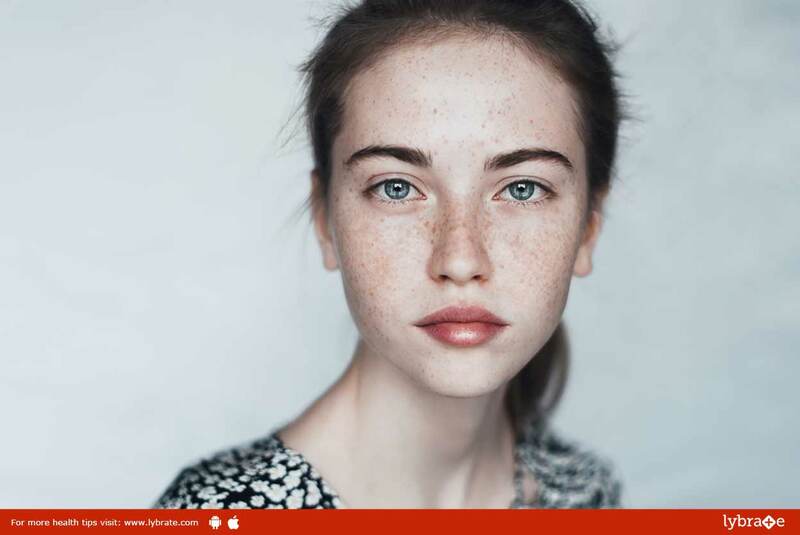 Genetic Factor: Genetic factors influence freckles. This has been suggested by studies which found that identical twins have extremely similar patterns of freckles while fraternal twins do not. 3. Melanin: Melanin is a pigment produced by cells called melanocytes. When melanin accumulates at one place, it results in freckles. 4. Fair Skin: Fair skin can absorb more UV rays than darker skin tones. This increases the rate of melanin formation and causes freckles. 5. Hormonal Disorder: Estrogen over stimulates pigment producing cells. This results in generation of excessive color when exposed to sunlight. This results in the formation of freckles. staying indoors and seeking shade. It is true that freckle prevention is more effective than freckle removal. Get a Chemical Peel: Peeling away the top layer of skin is an effective way to reduce the appearance of freckles, and may even lead to the elimination of lighter freckles. A chemical solution of phenol, trichloroacetic acid (TCA) and alphahydroxy acids (AHAs) is used to peel skin off and make it blemish-free. There is redness post treatment that can take a week to cure. This method works only when the spots are not too deep. CO2 Laser: In this treatment, the laser is made up of carbon dioxide, helium, nitrogen and hydrogen. The laser penetrates deeply into the skin yet retains the healthy tissues. It lightens spots considerably by removing the thin top layer of skin and allows healthy underlying tissues to surface and become the new and spotless, top layer of the skin. This procedure gives dramatic results but requires longer healing time. Laser Resurfacing: In laser resurfacing, an instrument is used to remove the old upper layer of the skin to reveal new cells. This leads to smoother and brighter skin. There is swelling after the treatment that lasts for 24 to 48 hours. Radiocautery: Radio frequency waves are used to remove age spots. It is done after administering topical anaesthesia. Minor swelling or redness may appear, which heals in a few days. ← Low Sperm Count – Ayurveda Is Your Best Buddy!